Constructed of strong, durable mesh with a nylon fabric trim featuring the popular Tough-1 Tough Timber print! Durable soft mesh and fleece wither protection offer optimal comfort for your horse. Shoulder gussets allow freedom of movement, while the tail flap helps reduce breakage. Note: Fly Mask and Fly Boots in the image are not included with purchase. Looked just like in the catalog & fit great! The sheet looked just like in the catalog & fit great! Excellent product. Survives draft horse who tears us everything! Would highly recommend this sheet. 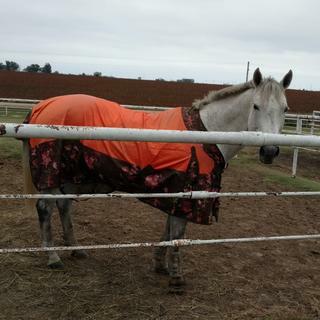 I like this fly sheet as it stands up well in a field with other horses who haven't been able to tear it yet. It is a bit heavier than others, however, so gets a bit warm. Just have to take the risk vs benefit ratio. It's adequate for my needs as it is lasting longer than I would have imagined. it was orange and with hunting season coming up and a horse who is elk colored, orange is important. Does this fly sheet come with the boots shown in the picture? BEST ANSWER: Fly sheet does not come with boots. Fly mask + boots sold separately. No boots, just the fly sheet. No. Does not come with boots. How is this fly sheet in very hot weather? BEST ANSWER: It is very thin and did not cause any extra heat for my horse. Kept flies off and no extra sweating.